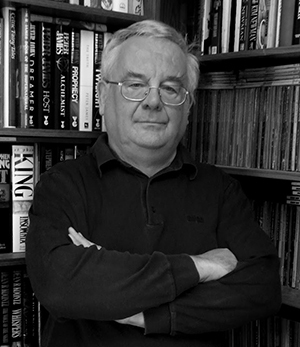 Ramsey Campbell is a British horror author. Born 1946 in Liverpool, England, Campbell is highly regarded as one of the greatest living writers of the genre today. Some of his earliest stories were published by August Derleth, with whom he forged a relationship that led to the publication of his first collection The Inhabitant of the Lake and Less Welcome Tenants by Arkham House in 1964, when Campbell was only 18 years old. Campbell’s fiction, especially in the early years, was heavily influenced by the work of H.P. Lovecraft. He primarily wrote short fiction at the outset of his career, published in many “best of” anthologies and collected in several volumes, one of the most notable being Demons By Daylight, also published by Arkham House in 1973. Campbell made the leap to novel-length fiction on the encouragement of agent Kirby McCauley, leading to the publication of his debut novel, The Doll Who Ate His Mother, in 1976. Campbell has a long list of credits to his name and enjoys the respect of some of the greatest authors of the genre due to his high quality prose and consistent output. He has more than 50 published books to his credit and a staggering list of literary awards, including the World Fantasy Award, the British Fantasy Award, the Bram Stoker Award, and International Horror Guild Award. A former president of the British Fantasy Society, he received the World Horror Convention’s Grand Master Award in 1999.